All independent testing labs seem to love Kaspersky Anti-Virus 2017. And that’s why it has consistently come out at the very top of antivirus rankings for several years. Perhaps Kaspersky Anti-Virus 2017 is the best antivirus when it comes to anti-phishing protection. Moreover, it tries to go beyond the call of duty and offers a ton of bonus features. Did we mention that Kaspersky Anti-Virus 2017 is extremely fast? And that’s why we think every online user should at least give one try to Kaspersky Anti-Virus 2017. Antivirus products are a lot like consumer products. They are similar in the way people search and buy them. When you want to buy a new appliance what do you do? Then you look at the appliance that has good ratings and then you come to your own decision. Similarly, in the case of antivirus products, you have to look at independent antivirus testing results from independent labs. Generally speaking, antivirus products that score the highest marks on these independent lab results are the ones you should buy. Kaspersky Anti-Virus 2017 is at the top of every independent lab result. It usually ranks at the number 1 spot. In a worst case scenario, it slips down a place or two. That’s why Kaspersky Anti-Virus 2017 manages to score a very high aggregate lab score. Though we should mention here that the 2017 version of Kaspersky is not as great as some of the previous versions. But perhaps, hackers have worked really hard in the past 12 months. The reason why you should trust independent lab results over anything else is that they have vast resources. They can put a lot of weight behind their research and tests. With that said let’s start with the full Kaspersky Anti-Virus 2017 review. If you sign up for Kaspersky Anti-Virus 2017 for a full year then you can protect up to three desktop computers. This subscription package will cost you $59.99. Sometimes you can catch a great discount offer and buy Kaspersky Anti-Virus 2017 at a markedly reduced price. Kaspersky also offers discounts to users who buy in volume. If you want a license that will protect five devices then you only have to pay $79.99. Increase the number of protected devices to ten and expect to pay around $19.99. Most of the times, you buy your Kaspersky Anti-Virus 2017 subscription from the official website. After the purchase, you have to log in to your official My Kaspersky portal. There, you must download the software application and then install that on your device. Make sure you always allow the Kaspersky application to download all the latest antivirus signatures. Kaspersky still makes use of a white and light green color scheme. And this is precisely what you will see when you log into the main window of the product. The only thing Kaspersky has changed as far as user interface is concerned, is the general layout. There are now four reasonably large icons that allow the user to scan for malware. Other buttons allow the user to update the antivirus signature database along with view reports and open the included on-screen keyboard. As mentioned before, they are much bigger than before. And Kaspersky designers use a two-by-two matrix container to arrange these four buttons. Before, Kaspersky designers laid them out in a single row. Some of the things are as same as ever. You still have that banner at the top. And it still shows the security status of your device. When Kaspersky detects a problem with your system, it changes the color of that banner to red. If the user clicks the red banner, then it displays the problems and allows the user to fix the “bad” stuff. If you want to perform a full system scan then expect it to take around 25 minutes. That may sound a lot, but it is considered as fast in the antivirus industry. The industry average for antivirus products is around 43 minutes. Antivirus products such as Microsoft Windows Defender and some others can take more than a full hour for a full system scan. As far as the degree of optimization is concerned, Kaspersky Anti-Virus 2017 again shines brightly. Because the second system scan finishes well under five minutes. Besides, we should keep in mind that most antivirus products don’t go through the trouble of offering more than what is required. 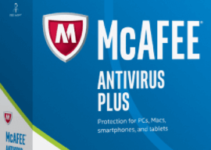 They are just happy with offering a standalone antivirus product. One of those premium but plain antivirus products is F-Secure Anti-Virus. Not Kaspersky Anti-Virus 2017 though. It offers a ton of bonus features. So many, that we don’t think there is another antivirus product out there that offers more. Kaspersky Anti-Virus 2017 is almost a security suite. And that is fast becoming the common theme amongst top antivirus products. The one bonus feature that has impressed us more than any other is the on-board keyboard feature. You only have to click its icon in order to see it prominently on your main window. But you can’t actually use it before a restart. Otherwise, it won’t work to its full potential. After the first restart, you are free to use it to enter passwords and other sensitive information. With an on-screen keyboard, hackers who use keyloggers can’t do anything against the user. And yes, an on-screen keyboard also protects against hardware keyloggers. To access the rest of the bonus feature, all you have to do is click on the More Tools button that is present on your main window. Kaspersky Security Network status. You can check it online. What does the rescue disk do? It basically removes the malware that blocks users from accessing their operating systems such as Windows. Some of these malware also prevent the user from launching Kaspersky Anti-Virus 2017’s malware scanner. Users who know that it is always better to be safe than sorry, always create a rescue disk. After creating one, you can just stash it away for some future need. Kaspersky Anti-Virus 2017’s vulnerability scan makes use of two different and varying system checks. The vulnerability scan can review the user’s Windows configuration settings. Then, it reports the ones that are a risk to the user’s security. It also provides options to fix those security issues. If the user doesn’t like what this feature has changed, then the user can easily roll back the recent changes. Moreover, the vulnerability scan feature also searches for applications that are not updated properly. If a software application requires security patches, the vulnerability scan does nothing. That is not the case with Kaspersky’s full security suite though. The Software Updater on the security suite can make the necessary updates as well. Not the Vulnerability scan though. Even if it finds something, the user has to do the updating himself or herself. Users can launch the Troubleshooter scan from the More Tools menu as well. But both scanners are very similar. For example, both scans sometimes offer the user to turn off the AutoRun feature for some types of drives. This feature removes traces of computer and browser use. There is also the Browser Configuration Checker feature. This feature looks for existing problems in the user’s Internet Explorer configurations. As with most other bonus tools for scanning, the user can easily roll back the changes made by the scans. 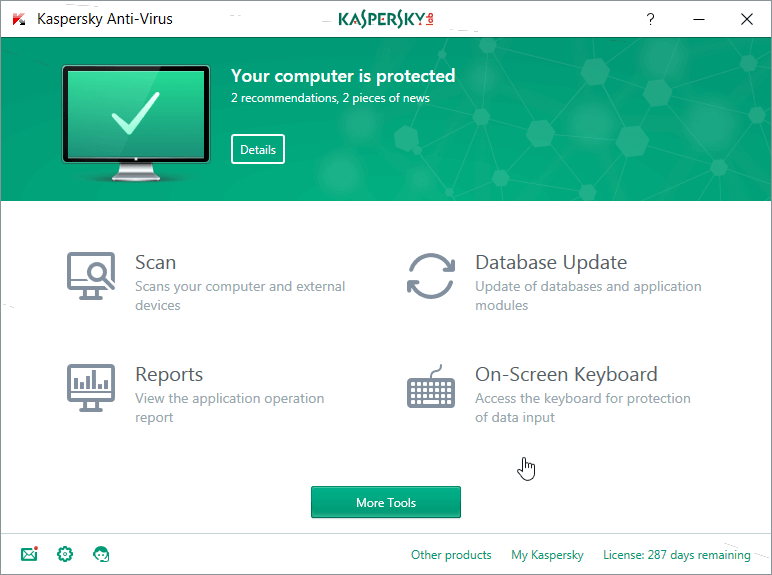 All reputed independent testing labs include Kaspersky Anti-Virus 2017 in their selection of antivirus products. Because it is one of the most trust antivirus products in the market today. As mentioned before, Kaspersky Anti-Virus 2017 ranks at the very top on almost all independent lab results. AV-Comparatives carries out a lot of tests to rank antivirus products. But not all of them are relevant. Five of those are and that’s what we like to follow. Kaspersky Anti-Virus 2017 earned an impressive Advanced + on every AV-Comparative test. This is the highest rating any antivirus product has achieved on AV-Comparatives tests. There is only one other antivirus product that equals this fantastic feat and that’s Bitdefender Antivirus Plus. The AV-Test Institute has pretty comprehensive criteria to rate antivirus tools. AV-Test Institute assigns six points at the max for each category. As far as protection against malware goes, Kaspersky earned a total of six points. It also scored a perfect six on performance impact. Which means Kaspersky is extremely light on your hardware. In the category of usability, Kaspersky scored another six. This last type of perfect score means that Kaspersky is flawless when it comes to false positives. It doesn’t flag legitimate websites and programs as malicious, in other words. Don’t know if you’re keeping count, but that is a perfect 18 score on AV-Test Institute tests. Other great antivirus products like Trend Micro Antivirus+ Security along with Norton and Avast all scored 17.5 on the same tests. MRG-Effitas is another independent lab that has secured a good position as a trusted ranker of antivirus products. MRG-Effitas is different from all other independent labs because it is weird. It is weird in the sense that it does not rank antivirus products based on a score or a star. It ranks them through terms such as pass and fail. And that’s why a number of antivirus products flat out fail its tests. Among the very few antivirus products that passed its tests are Webroot SecureAnywhere AntiVirus and of course, Kaspersky Anti-Virus 2017. The lab has this 360 Assessment tests that exposes antivirus products with hundreds of in-the-wild samples of malware. Then, the lab rates these antivirus products based on how competently they protect users on their own. It awards bonus marks to antivirus products that do the job with minimal user interaction if any. If an antivirus product wants to gain the Level 1 certification then it has to completely block all malware samples from installing themselves on the given test system. However, if an antivirus product lets some samples slip but in the initial run but eliminates them within twenty-four hours then the lab awards a Level 2 certification. If an antivirus product falls below that then it gets a fail. Again, very few antivirus products passed MRG-Effitas tests. Only premium antivirus products such as Webroot and Symantec Norton Security Premium manage to pass tests and receive the lab’s certification. Kaspersky Anti-Virus 2017 is not a participant in many certifications programs. Some of these certifications offered by the likes of ICSA Lab and West Coast Labs don’t have Kaspersky Anti-Virus 2017 as their test product. Kaspersky Anti-Virus 2017 has also skipped Virus Bulletin’s Reactive and Proactive tests. But does that hurt Kaspersky Anti-Virus 2017’s final rating? Our research for this Kaspersky Anti-Virus 2017 review still gives Kaspersky Anti-Virus 2017 a solid 9.5 out of 10. There is hardly a lab out there that does not respect Kaspersky Anti-Virus 2017’s capabilities when it comes to protecting users against malware. By default, Kaspersky Anti-Virus 2017 is configured to manage any found malware without the need of a user intervention. With that said, it doesn’t just “kill” all bad objects. Instead, it takes a precautionary approach and tries to stay away from deleting objects it considers “probably infected”. If one wants to test an antivirus product sufficiently then these features are not very useful. So most reviewers say we should turn these off so that we know what’s happening. To test Kaspersky Anti-Virus 2017, some reviewers like to use malware samples. We are pleased to inform you that Kaspersky Anti-Virus 2017 handles all such malware samples with instant deletion. Its processes do take their time. As mentioned before, Kaspersky Anti-Virus 2017 doesn’t just delete infected objects. First, it tries to disinfect them. Then it quarantines them if it can’t disinfect them. Our research tells us that Kaspersky Anti-Virus 2017 can wipe over seventy percent of such samples at this given stage. 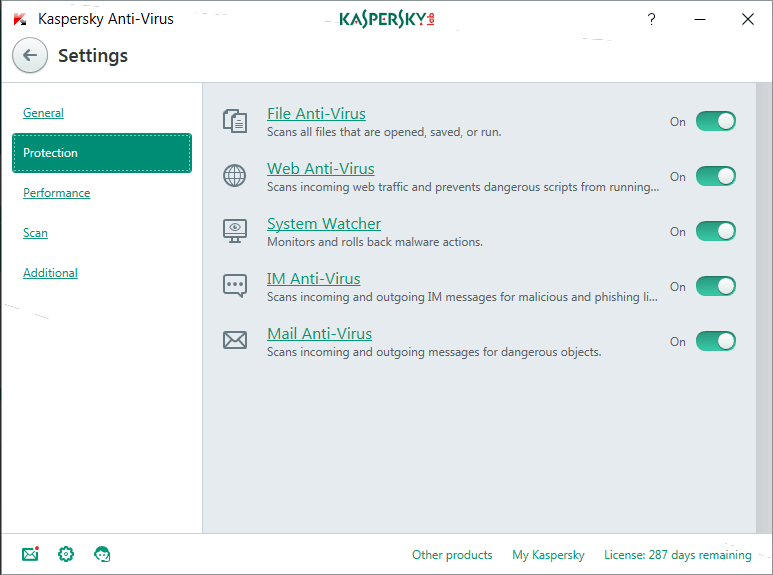 Kaspersky Anti-Virus 2017 is a great antivirus product because it has some really neat features. Our research shows us that Kaspersky can report suspicious behavior even if a malware manages to install itself on a given machine. Upon detection, Kaspersky Anti-Virus 2017 asks the user to roll back the suspicious program’s malicious activity. After that, the antivirus product moves forward and performs an advanced disinfection action. Kaspersky Anti-Virus 2017 can wipe out all traces of even the most stubborn of malware samples. This is something other premium antivirus products such as Webroot also excel at. Our research shows, Kaspersky Anti-Virus 2017 can sometimes forget to react to some of the malware samples. Expect Kaspersky Anti-Virus 2017 to detect somewhere between eighty to eighty-five percent of malware samples. That gives Kaspersky Anti-Virus 2017 a score of 8+ out of 10 in this test. This score is slightly lower than what some of the other antivirus products have managed to put up on similar tests. To test any antivirus product for malicious URL blocking, it is a good idea to go through MRG-Effitas, malware-hosting URLs. The lab provides a daily feed of such URLs and they are great for testing purposes. Basically, all you have to do is launch URLs from your current day’s daily feed. And then simply observe if an antivirus product blocks access to those malicious URLs. A good antivirus product will not only block these but also wipe out any downloaded samples of malware. The not-so-good antivirus products, sometimes, do nothing. Our research for this Kaspersky Anti-Virus 2017 review tells us that all antivirus products must go through at least a hundred of these URLs before making the final call. Kaspersky Anti-Virus 2017 can block up to 65 percent of such URLs. It does that by forcing the browser to move away from malicious URLs. As you can probably tell, that 65 percent isn’t a great percentage. Especially if we compare it with Avira Antivirus Pro’s 99 percent and Norton (and McAfee Antivirus Plus) 91 percent. There are some antivirus products which do not participate in a lot of lab tests. For those antivirus products, the only way to test them is via hands-on tests. Other antivirus products perform great in lab tests as well as hands-on tests. Those are the ones you should sign up for. As indicated earlier as well, Kaspersky Anti-Virus 2017 is flawless when it comes to independent lab tests. But it doesn’t perform as well in some reviewer’s hands-on tests. Which is of course puzzling. Since independent lab results are much more reliable since labs can test antivirus products much more comprehensively and holistically. Kaspersky Anti-Virus 2017 is very clever when it comes to protecting users from hackers. Basically, Kaspersky Anti-Virus 2017 uses its browser plug-in for a dual purpose. First, its browser plug-in protects users from malicious URLs. You know that because we detailed it in the previous section. Second, the same browser plug-in feature keeps users away from phishing sites as well. Phishing sites are basically fraudulent websites that steal the visitor’s login credentials. If a user loses sensitive login information then the amount of damage can become great. Kaspersky Anti-Virus 2017 is a different beast when it comes to phishing protection. It is not that great at malicious URL detection. But that’s not the case with detecting anti-phishing sites. To test for such phishing sites one must find a source that reports fresh fraudulent sites. There are many fraudulent sites that take a while to end up on phishing blacklists. To test an antivirus product for anti-phishing ability, reviewers launch phishing URLs in different browsers. Norton protects one of these browsers because it is The King when it comes to anti-phishing effectiveness. The antivirus product under testing protects another browser. While the other three browsers (Internet Explorer, Firefox, and Chrome) have nothing but built-in anti-phishing security features. Of course, one can’t test malicious URLs that no longer load or aren’t really phishing websites. Phishing URLs are never the same. So the only way to measure an antivirus product’s success if by comparing it with Norton’s results along with the three browser’s. We don’t know of an antivirus product that has beaten Norton in this category. Apart from Webroot and Bitdefender that is. In fact, some antivirus products can’t even compare with built-in antispin browser protection. What about Kaspersky Anti-Virus 2017 then? It beat Norton, Webroot, and Bitdefender along with all the browsers. Kaspersky Anti-Virus 2017 beat Norton by a clear 5 percentage points in phishing tests. 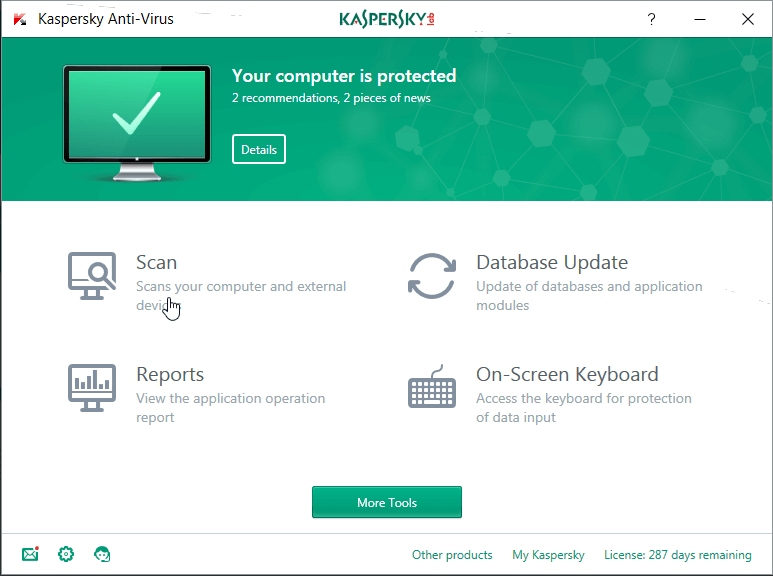 Should You Buy Kaspersky Anti-Virus 2017? 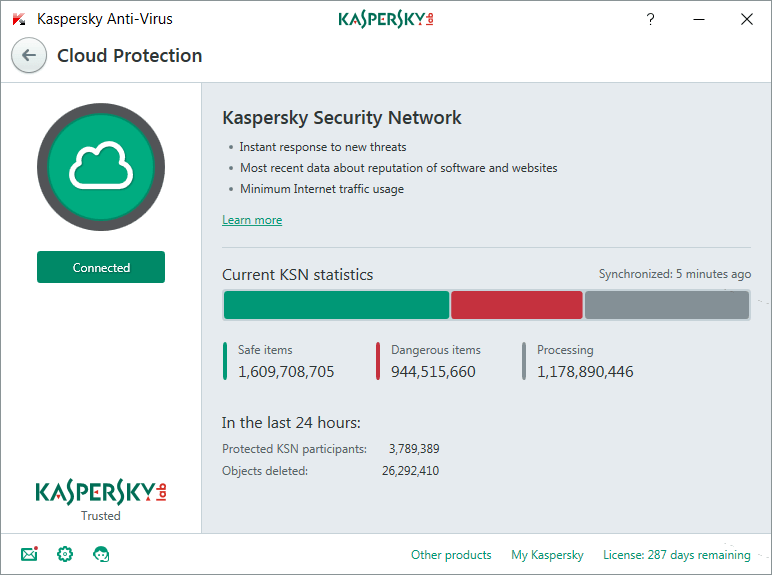 If you have faith in independent labs, and you should, then Kaspersky Anti-Virus 2017 is a winner. It has excellent scores on all independent lab tests. 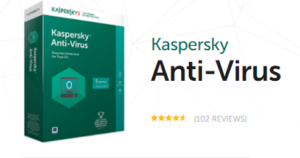 And even though sometimes, it performs unevenly when tested via reviewers, Kaspersky Anti-Virus 2017 is one of the most secure antivirus products in the market today. It has a fast malware scan and has several bonus security features which some might consider as essential. 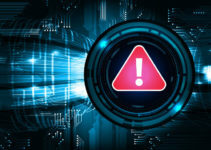 If your computer has an unknown program that is exhibiting malicious behavior, then Kaspersky Anti-Virus 2017 can stop it and roll back all its actions from the beginning. If you are looking for standalone antivirus products that are perfect, then Kaspersky Anti-Virus 2017 is it. are fast catching up to Kaspersky Anti-Virus 2017.